1-9045-0283. 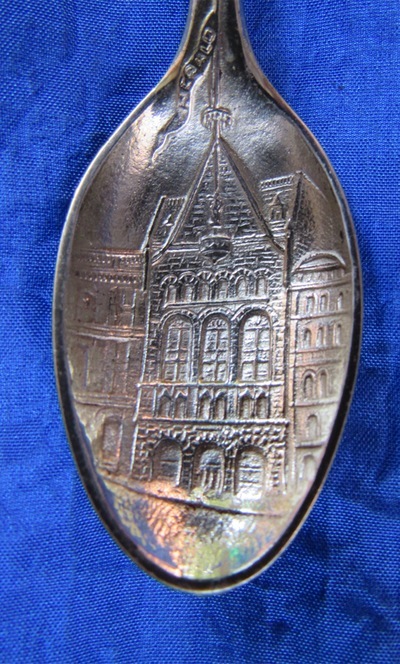 Sterling Silver Enamel Souvenir Spoon New York Prospect House." BL: bright cut engraved view of “Prospect House. Blue Mt. Lake N.Y."
Metal: Sterling. Entire spoon = gilded. BL: bright cut engraved view of “Arverne Hotel” + “Arverne L.I.” within a scalloped bright cut engraved oval. BL: bright cut engraved view of “Ocean Ave. Hotel” + “Patchogue L.I.” within a scalloped bright cut engraved oval. Hdle obv. Enameled finial with enameled view blue forget-me-nots + green leaves. Minor crazing along the edges of the enamel on the handle = tiny chipin white enamel at upper edge. Stamped: Sterling (this spoon may have been made by Fessenden)-?? Hdle obv. Enameled finial with view of enameled lily of the valley (white enamel flowers) + (green leaves). BL: embossed view of "Public Library, N.Y."
18-9045-00000000. 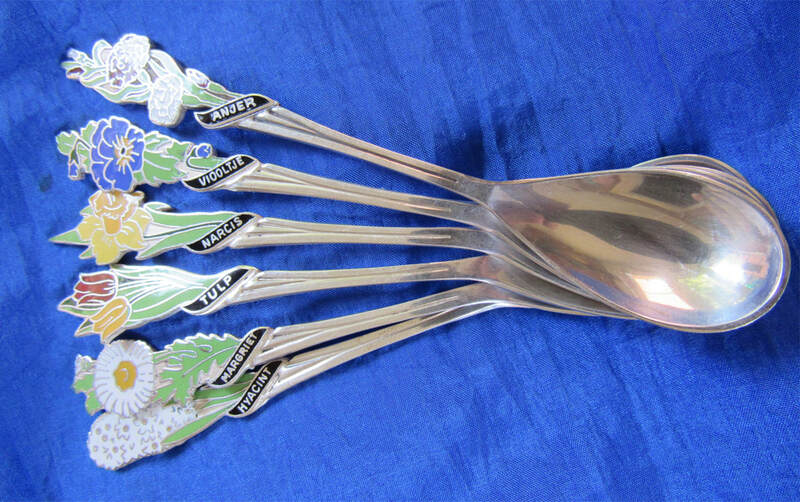 Sterling Silver Enamel Souvenir Spoon Bridgehampton L.I. Hdle obv. enameled view of sunflower at finial + decorative leaves on stem. 20-9045-8001. 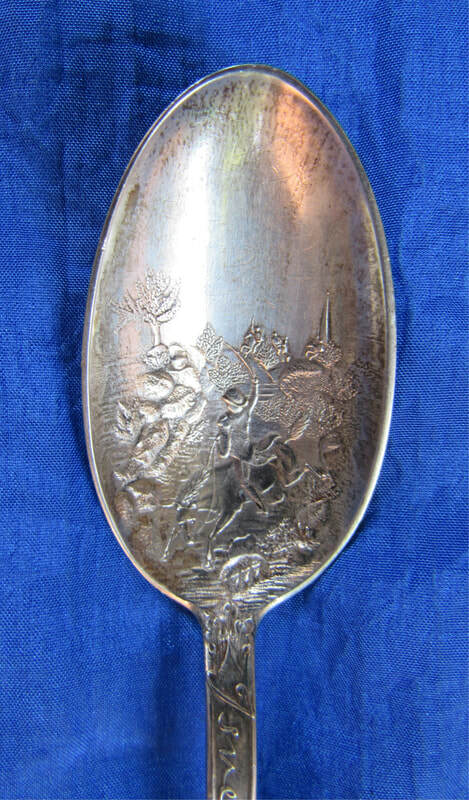 Sterling Silver Cast Souvenir Spoon. Garfield. Perry’s Victory. Battle of Lake Erie. Hdle obv. cast bust of Garfield at the finial + “Garfield” below on decorative ornate shank with laurel at the base extending into the bowl. BL: deep cast bowl depicting the iconic image of Commodore Perry (based on William H. Powell’s painting [hanging in the U.S. Capitol] titled the “Battle of Lake Erie”) transferring from the USS Lawrence to the USS Niagara via a small rowboat. Hdle obv. cast bus of Andrew Jackson at the finial + decorative laurel leaves below + “Nashville” on the shank (in the shape of a columns). BL: cast view of “The Hermitage” with two cabins— one of which was Jackson’s home while the grand brick mansion was being constructed. 22-9045-8003. Sterling Silver Souvenir Spoon Robert Ingersoll. Hdle rev. stamped “1892’ referring to the Patent date(February 2, 1892). Patent No. 21,334. Patentee: Otto Wettstein. Hdle obv. cast view of eagle at finial + 13 stars descending down the shank. The original spoons has “Washington” on the banner above the eagle and “e pluribus unum” on the banner below the eagle. MK: Gorham (The number “18” which is on the original spoon is missing from this reissue). Hdle obv. cast view of a cotton boll within a crescent on which is the word: “New Orleans; the shank = in the shape of a sugar-cane — all these images being associated with the economic prosperity of New Orleans. Hdle obv. embossed view of a burro loaded with boxes (supplies) for the mining expedition. One box = embossed “Danger” + “Manitou” on the shank. Burro is standing on the Pike’s Peak cog road. 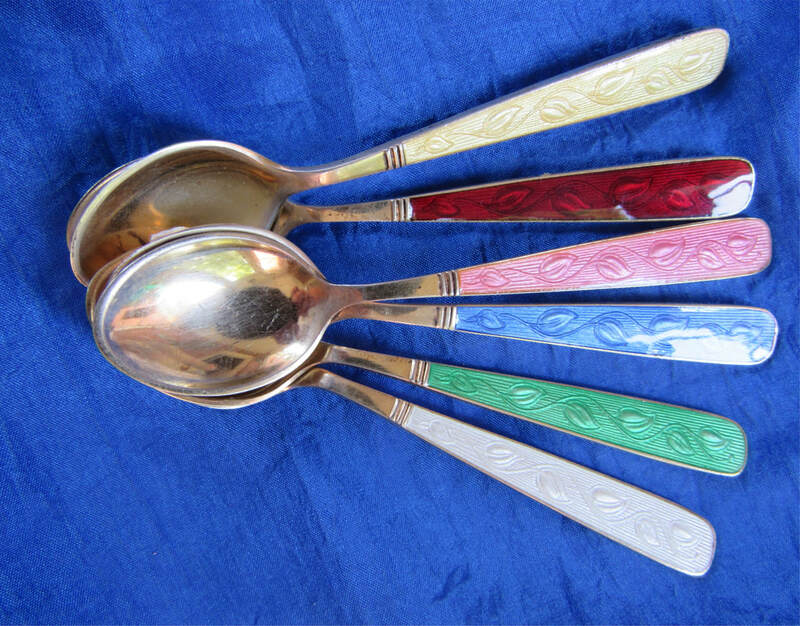 handles in dark red, yellow, pink, white blue and green; spoon handles have transparent enamel with leaf pattern visible underneath. Enamel = mint condition; not cracks or chips. All spoons = gold washed. MK: marked V.B. Sterling =Volmer Bahner (renowned Danish silversmith, famous for his jewelry creations). Note 4 of these spoons are marked "V.B. Sterling." Two (white enamel and yellow enamel) = have no marks. Hdle obv. 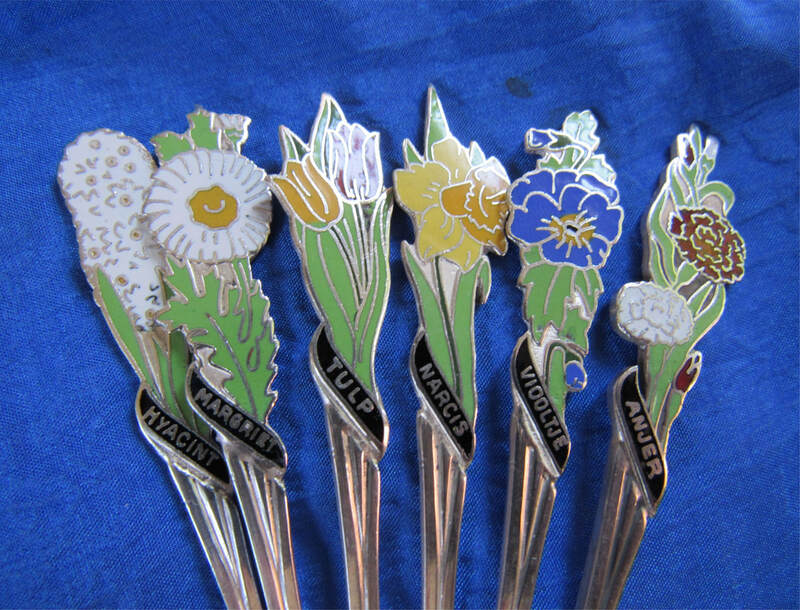 Six (6) spoons = sold as a set: name on handles (left to right): hyacint, margriet, tulp, narcis, viooltje, anjer. Hdle obv. Decorative handle. The iconic Repousse silverware pattern by Kirk Stieff made its debut in 1828, making it the oldest sterling silver pattern produced in the United States. To create this pattern, Samuel Kirk, a Philadelphia-trained silversmith, revived an ancient technique known as "repousse" to create an embossed design that’s as versatile as it is unforgettable! BL. Bright cut engraved view of two cats facing each other (standing on a fence) + “Kill Mts” below.